Playing Mahjong is a classic leisure game for Cantonese in Hong Kong. Nowadays, even people from the western culture love this game. On any weekend, get together four playmates, and you can start playing the game. The games are winned at different levels, generally ranging from basic to Level 4. However players have to agree the rules of the game before starting. Winning rules: Last weekend, we had a beginner in our group, so we allowed Basic. For experienced players, some start at Level 1 or even Level 3. You would need to set the ceiling for some special winnings. Money rules: You would also need to agree on how much you are going to bet, such as $0.1, $0.5 or $1 per point. Notes: If you allow Basic and less than $1 per point, that is really for fun. However if you set a minimum of Level 3 and $1 per point, that's marginally gambling. Beyond that is really gambling - I don't recommend that. Last Sunday, I had a classic Level 8 win which I won 128 points. We played for HK$0.1 per point, so my total win was HK$12.8. However if we played for $1 per point, I would have won HK$128 in that single game. 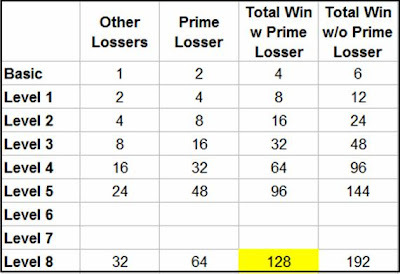 I have worked out an illustrative table to demonstrate the winning amounts according to different levels of winning. The numbers grow in geometric series, so the amount involve will be tremendously huge if we don't set a ceiling. We had a ceiling of Level 8 and also decided to skip Level 6 and 7 (paid at Level 5 only). It may sound complicate if you are new to the game. Once you get to know the it, you'll fall in love with it. WARNING: Don't get addicted to it.